Toroidal Transformers - Agile Magnetics, Inc.
At Agile Magnetics, our extensive experience in custom magnetics extends to all types of transformers, including custom Toroidal units. Toroidal is a core type of single-phase transformers, known throughout the industry for their excellent efficiency and power handling. These transformer units regularly cover wattages ranging from less than 10VA to over 2500VA. 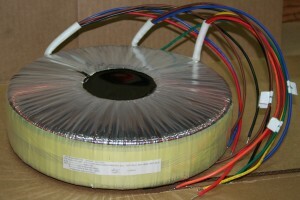 Utilizing proprietary software, we use unique computer modeling for all of our custom Toroidal Transformers to ensure that each of our clients’ individual electrical specifications is met. All of our work is also fully ISO compliant, ensuring high quality and efficient operations at every step of the process. Furthermore, we meet or exceed the toughest industry standards, including UL, CUL, CE, and VDE—with UL and CUL markings available by request. We maintain a 40,000 square foot facility to take on projects of virtually any size and scope. Our custom transformers are manufactured from print designs in the most repeatable and reliable methods available. To find out more about our custom Toroidal Transformers and how they can benefit your next project, please contact us directly.